Launceston Young Farmers visited the National Lobster Hatchery at Padstow last Thursday to explore the conservation work which is done in order to improve the sustainability in fisheries and aquaculture. The club learnt about the processes involved, which included collecting eggs from female lobsters, rearing larvae and releasing the lobsters within the surrounding sea. It was explained to the club about ongoing research projects, many of which have helped to enhance the stock potential of the European Lobster. The eye-opening evening was extremely interesting for members. Morning all, this week's farm walk is at Treovis Farm, home of Cornish Willow. Drive straight across this junction following the B3254 passing through Berrio Bridge and Middlewood. After leaving Middlewood drive for a further 1 mile and you will come to a cross roads, known as Treovis Cross, where there is a sign to Treovis pointing to the left. At these crossroads turn right and you will find us about 50 yards on the left. The club were warmly welcomed to Bude Pilot Gig Club last Thursday to enjoy an evening of gig rowing at Tamar Lakes. After being given a brief introduction into the history of the sport and production of the gigs, the Young Farmers were able to have a go! Launceston YFC was divided into groups of 6, and under the watch of the enthusiastic members of the Gig Club the Young Farmers were able to experience the sport. A gradual row to the end of the lake turned rather more competitive on the way back when the teams raced towards the finish line! We would like to thank Bude Pilot Gig Club for giving Launceston YFC a fascinating insight into this exciting sport. 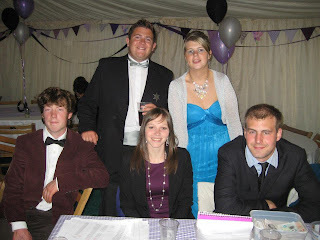 Launceston YFC hosted a Saloon Summer Ball this year at Smallacombe Farm, Lifton by kind permission of Mr and Mrs D Northey. After a delicious two course roast meal (many thanks to Mary Andrews and Launceston Brownies for all their help) music was played by the Boogaloo Dudes and BK discos and the evening was danced away! We would like to thank everyone for their help and support. The marquee is up and nearly set for Launceston YFC's Saloon Summer Ball. The final touches are under way today and we look forward to seeing everyone tonight!